Now this morning I'll admit I'm in a bit of a rush. Last night I was at my sugar craft course, so funnily enough didn't have time to make a batch of cinnamon biscuits and bagels from scratch....I know I know I'm letting myself go. So this morning as I'm rushing, I'm having something quick. These glazed and toasted oats are something you can prepare easily and keep at arms reach in the cupboard for tossing over yoghurt or putting in smoothies. It's a nice alternative to cereal, and is much cheaper too! You can use any type of oats. This week is about sharing ideas that are simple and easy, not difficult and un-doable. Some mornings I have time, other mornings I don't, and this is a prime example. 1. Melt the butter, sugar and syrup in a saucepan. Don't allow to bowl. 2. Remove from heat and stir in oats. 3. Mix well, ensuring all the oats are coated. 4. Over a medium heat, continue to stir the oats for 4-5 minutes. 5. Pour yoghurt into bowl, add desired amount of oats on top and add honey. sugar. All breakfast cereals have fats and sugars in them....it's just that you can't see them! Well, that really sounds simple. I have a good supply of oats at all times. 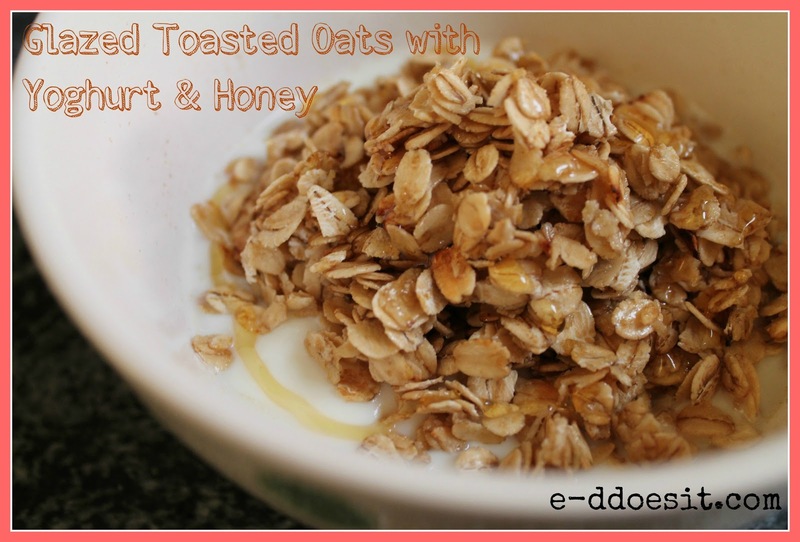 I love Oats, you can do so many great things with them and they really fill you up!